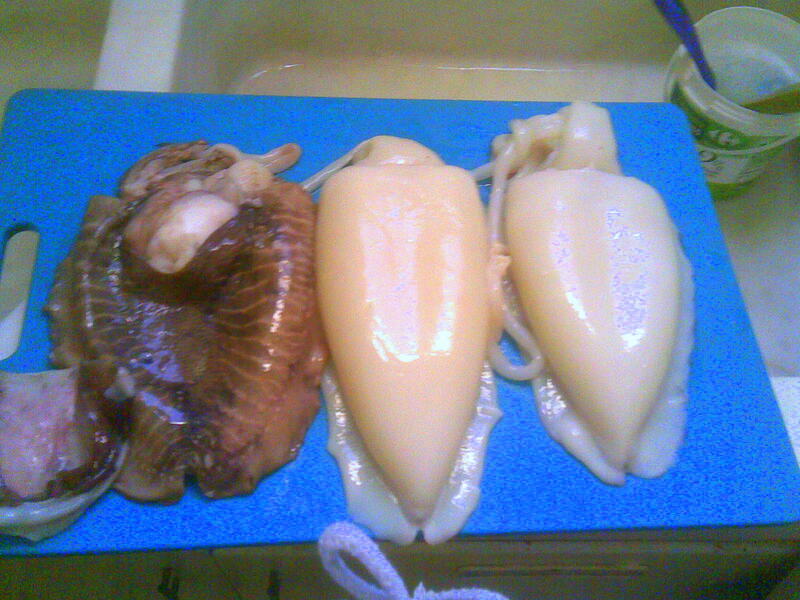 ﻿ Cuttlefish, Calamari, and similar can be eaten during Christian Orthodox Lent and any other time of the year. When they are well cleaned as the two on the picture to left it is very easy to cook them. They are treated just like any other protein but need some extra time cooking. I usually cook this dish with tomato sauce, tomato paste, sun dried tomatoes lots of garlic, sliced olives, capers, origano, white wine and.....CHILI peppers (or one Habanero pepper). - 1.2 kg of big cuttlefish about 3, skinned, well washed, sliced in half inch rings. - 1 kg fresh spinach, washed three times and chopped. - 8 cloves of garlic crushed and finely chopped. - 12 sun dried tomatoes in oil roughly chopped. - 500 gms of grated tomatoes juice and all. - 2 Tbsp. of tomato paste. - 1 big hot red chili. - Olive oil (prefer Greek, extra virgin Kalamata olive oil). - 1/2 cup of dry but fruity white wine (Flisvos by Tsandalis) ....drink the rest while cooking !! - 1/2 cup pipped, sliced black Kalamata olives. - 1/4 cup capers chopped. - 1 tsp. dried origano. - Add enough olive oil in large pot to cover bottom. Heat. - Add the cuttlefish and strir fry for 2 minutes. - Add the garlic and stir till the beautiful aroma reaches you. - Add wine and stir till wine odor is expelled. - Add all the tomatoes, olives, capers, chili, and origano stir and mix well. - Bring to a boil, cover and simmer for 15 minutes. - When done, add the chopped spinach, cover and mix every now and then till the spinach is cooked. - Check for liquids. If too much liquid, simmer with cover open, till the liquid evaporates and sauce is thickish. If you cannot wait then laddle off any excess sauce. Serve over white basmati rice. No need for a salad in this recipe since there is the spinach. I would suggest a dry, but fruity white wine similar to the one used for the food.